Universal Themes, part of the Depth and Complexity framework, give you an easy way to take your lessons across all content areas. In this video, we'll introduce the Themes and start an opening activity. 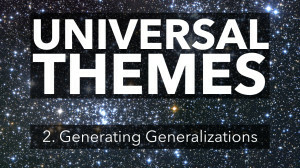 In this video, we'll take students from a very abstract Universal Theme to practical statements known as Generalizations. These are a tool to unlock connections across subjects. In this video, we'll use Universal Theme and Generalizations to organize your instruction at the lesson, unit, or even subject level.